You just know that Joe and April Muraco of Plaistow, NH, are good people. 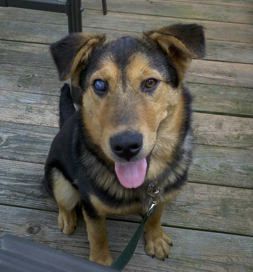 They were able to, well, turn a blind eye to Tank’s blind eye when they saw him listed on Petfinder. Their goodness let a five-month-old German Shepherd pup find his forever home with them. Read the story in April’s words. His partial blindness doesn’t dampen his zest for life. He loves taking walks around the lake near the couple’s home, where he gets to nose around with new canine pals, although, according to his new “mom,” he sometimes gets a little overenthusiastic. Joe and April’s feline family members are rather disgruntled by that same overenthusiasm and are having a bit of a hard time adjusting. “We’re hoping that their relationship will get better as soon as they learn to work around each other,” April says. As good pet parents, the Muracos are enrolling him in obedience classes for a little fine-tuning. The kitties will soon be able to breathe a collective sigh of relief.